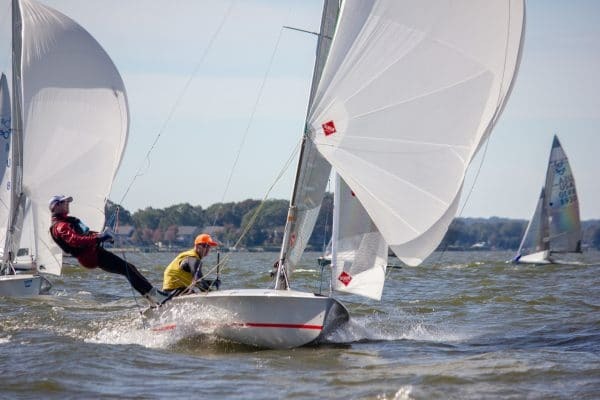 Twenty-four teams from as far south as North Carolina, as far north as Toronto, and as far west as California sailed nine races in shifty, light-to-moderate conditions on the Chesapeake Bay. Carl and Mike sailing Curtis’ Ovington/Jess boat with P and B sails won. 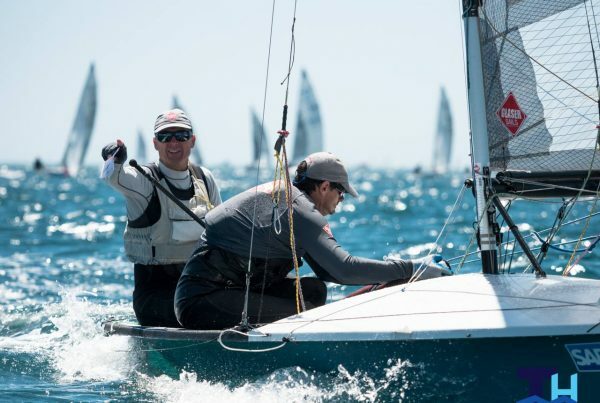 Chris Brady and Matt Barry sailing License to Kill with Glaser sails were second on the strength of their two race wins on Day 2. Drew and Tyler were third in Tyler’s new Rondar with P and B sails. Peter Scannell and John Dunlea had a career-best performance, including a bullet, and were fourth. New participants included Jackson Montague, R. J. Bay, Joe Morris, and Xan Schlegel. 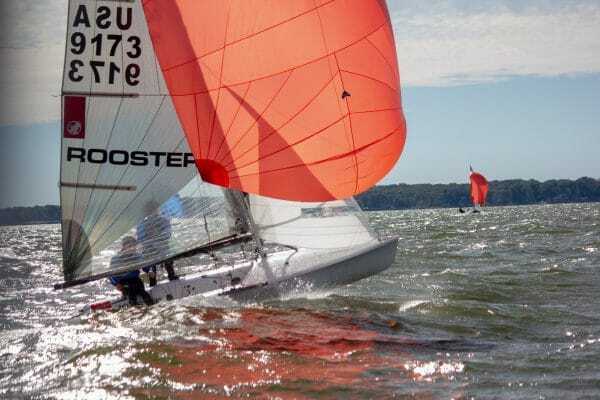 Day 1 gave us five solid races in wire running conditions with some lulls in a nice south-westerly. We don’t often sail in south-westerlies so people were figuring out the breeze. Carl. Mike and Drew/Tyler had the best days. No surprises there. Day 2’s forecast for a 10-20 westerly didn’t materialize. Instead, we had 6-10. Oh well. But it was good tough racing except for one race. Chris and Matt mastered the conditions and won two races. Drew and Tyler had some tough breaks and slipped into third overall. But the forecast was Day 3 did materialize with a 25-30 knot north-westerly. The wind by itself presented significant challenges. It also blew a lot of water out the river so it was very shallow on the way to the racecourse. Everyone agreed – the event was over. West River Sailing Club and our sponsors believe in 5o5 sailing and were excited to support the event. West River Sailing Club gave us a strong race committee, chaired by Heidi Bay, and sufficient support boats. The club supplied exquisite housing for everyone who asked. The club gave us two good dinners. Our sponsors deserve special mention, too. Pease and Jay Glaser provided a new set of gaskets and other swag. Ronstan donated some of the daily awards and provided a significant discount on the final awards. The Bayfields bed and breakfast donated housing. APS donated several gift certificates. Thanks to each of them. This event proved we can get 35 boats at a good east coast event. 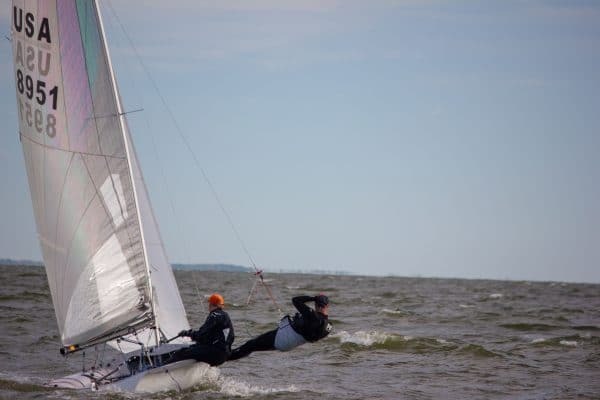 There were some new strong sailors at this event in both ends of the boat. That was great to see. They will be back. There are a lot of folks on this list who wanted to sail but couldn’t because of life’s distractions, disorganization, or lack of planning. Get organized and come next time. Next up is Hampton, November 3-4. And then the Florida Mid-winters, February 1-3.